Marcus Foligno, probably more than anyone else on the Sabres, learned that Ted Nolan uses ice time as a reward and punishment. During the final week alone, Foligno bounced from the first line to the fourth to the second and back to the first. The coach had his reasons. While the yo-yo treatment could be considered a valuable lesson on its own, Nolan and former assistant coach Joe Sacco supplemented it with lengthy chats. Buffalo hopes Foligno takes advantage of the teachings to become a consistent contributor next season. “They’ve taught me a lot about what it takes to play in this league,” Foligno said. “They’ve been getting some messages across once in a while. If you’re ready to play every night, you’re going to get ice time. If you’re not, the ice time is going to slowly dwindle. Foligno warranted extra attention because he has uncommon attributes. He’s a 6-foot-3, 223-pound forward who can play center or wing. He has the size to be physical and has shown a scoring touch. The trick is becoming a player who can stick in the top six rather than bounce from line to line. Foligno had six scoring droughts of seven games or more, including a pair of 11-game skids without a point. Though he was second on the team with 206 hits, there were too many games he’d float by without rattling the glass. The 22-year-old desperately wants that. He was born in Buffalo when his father, Mike, played for the Sabres, so he knows what the town can be like when the team is winning. “I want to be a part of that, and a lot of people do,” Foligno said. “Like Tim Murray said, the guys who want to be here and who care are going to be here. That’s what it comes down to. 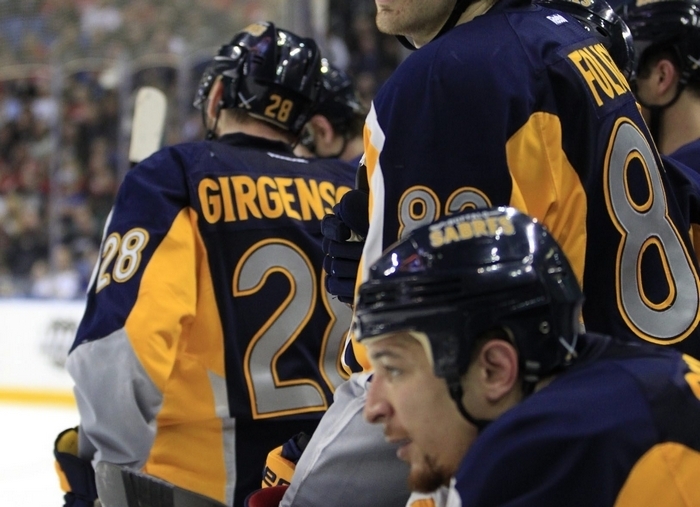 Foligno had seven goals and 19 points in 74 games, bringing his career totals to 18 goals and 50 points in 135 games. He’s learning that points won’t come every night, but the effort has to always be there. “You’re not always going to have perfect games, but you’ve got to do something you’re consistently good at,” Foligno said. “That’s one thing I’m learning – to be a good hockey player – and once I figure that out, it’s going to help my career and help my game. Foligno finished the season with an injured shoulder and is weighing whether to have surgery. Either way, he hopes to come back stronger. John Vogl – John Vogl spent 15 seasons writing about the Sabres for The Buffalo News.